Yup, I'm one of those moms. By which I mean that I'm totally of the opinion that children can learn how to behave properly and delightfully in "adult settings." They can learn to be quiet, sit (moderately) still, hold breakable items without actually breaking them, and contribute to society in general. Can they always do this perfectly? No. They are just children who are about the business of learning to be adults. But this does not mean that they are unteachable and/or should not be welcomed in our midst. My children, like many others (boys included), love a good tea party. They, too, enjoy the fancy table settings and fun foods. They like sampling the teas and dressing up in their fancy clothes. It's great fun! As many of you are aware, I like throwing tea parties in my home. I don't always throw teas which involve the kids. Sometimes the tea is a strictly grown-up affair and I think those are fun too. However, there is something very special in having one's children participate in life's little celebrations and a tea party is one such celebration of beauty and joy and friendship that I'd like for them not to miss out on. I really dislike excluding my kids, in part because I know that they are disappointed when they aren't included. I couldn't really include them in the fun as regularly as I do though if we didn't practice our manners "off set" so to speak. Children who are well-behaved in public are ones that have been trained in private. They aren't well-behaved naturally. They are well behaved because a lot of work went in to the training. Please know that I don't think I have perfect children, but I do know that my kids and I have the same desire in our hearts: to do life together. That means that we do spend a fair amount of attention on eating politely and paying attention to the way our body moves so as not to break things, or disrupt times of fellowship. Every so often we'll find a decent book to read which allows us to address particular aspects of behavior in (and out of) good company. Children's Tea and Etiquette: Brewing Good Manners in Young Minds is one such book. Admittedly the cover art makes it look droll and boring but let's say that it's the inside that counts in this case. How to shake hands with others (and the proper way to do so). How to smile and make eye-contact. How to sit in a chair. How to drink a cup of tea. How to eat a scone. How to leave the table when you are done. Polite words and language to use. This book also talks a little bit about the history of tea which is great for older kids but not of much interest for the younger kids. I can hear you now, "How can anything in this book be of any interest to any kid?" This is a popular question in today's society. There is a general consensus that a.) children are not interested in sitting still and "going through motions of politeness" and b.) that children are incapable of doing so. I disagree. Children very much enjoy being involved in unique, "fancy" and creative things. A tea is rather filled with imagination if you think about it. You dress up. You create interesting foods that you don't normally eat. You create beautiful table settings and light candles. If you make it sound like a special treat, it instantly becomes one. Furthermore, children are perfectly capable of learning how to address their elders and peers politely and to be still and quiet so as to allow all types of fellowship to take place. As I say, I'm a big fan of teaching kids at home and trusting them with even breakable items so that they can learn to be careful with things in their possession and control. I do allow my kids to use real tea cups when we have tea together and with others. I'm not worried if one of my cups is broken. It is easily replaceable. Replacing memories is much more difficult. In order to feel at ease in handing my children, and my children's friends, real tea cups to use, I shop Goodwill and other thrift stores. I've created a small collection of cheap-to-me cups which are beautiful but not personally meaningful. If one breaks, it breaks. A child can come to our home and feel free to use a cup and be a part of an adult event. That's more important to me that a rose covered cup remaining perfect (and unused) on a shelf. I don't want to worry about the "stuff"; I don't want them to worry; I don't want their parents to worry. Thrift shop if it'll make you feel better about creating fancy events for you and your children to enjoy! Another thing about Children's Tea and Etiquette is that it concludes with the concept of writing a thank you note. I can't tell you that my kids enjoy writing thank you notes (or that I've ever thought to write one after being invited to an event) but the words "thank you" never offend! Teaching children to say thank you is a good habit to get into. Explaining why one ought to say thank you is an even better lesson. This book provides good food for thought in that direction. I know this post sounds really matter of fact regarding the expected behaviors of children. I do tend to sound rather emphatic when talking about what they can be expected to do and how they can be expected to behave. But I do get so tired of hearing the message that children aren't wanted around adults that I feel rather passionate about making them a part of the action. I care about my children being involved in my life and being welcomed into the lives of others and so I perhaps come across rather strong. There is no wish to offend, but simply a desire to share the idea that children are a blessing in our lives right this very minute. They are not a future blessing, 15 years from now. I am all about sharing this book with others if it in any way helps others to see that children are a beautiful addition to both our lives and to society at large. Helping children learn how to appropriately contribute is a worthy goal in my estimation and I thank anyone who will purpose to train and teach so that we might all enjoy. Agreed! 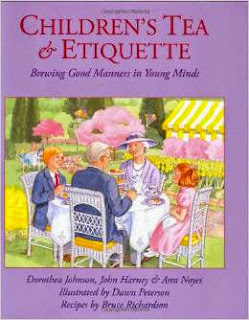 I *loved* etiquette and being "fancy" when I was a child - and appreciated those who taught me the rules and expected me to follow them. It's a shame that so many have such low expectations of children. Sounds like a good book! I agree children can be expected to be relatively still if they're taught to do so. Though we taught manners (though never "tea manners" - wish I'd done that! ), a couple of mine thought that women invented manners to control men. :-) Thankfully they seem to have learned them anyway and can function in polite society, and, I think, see the benefit of them now. This sounds like a fun book and a fun way to teach manners! I agree--children can certainly be expected to sit still and be good company! How do you eat a scone?? "children are a blessing in our lives right this very minute. They are not a future blessing, 15 years from now."